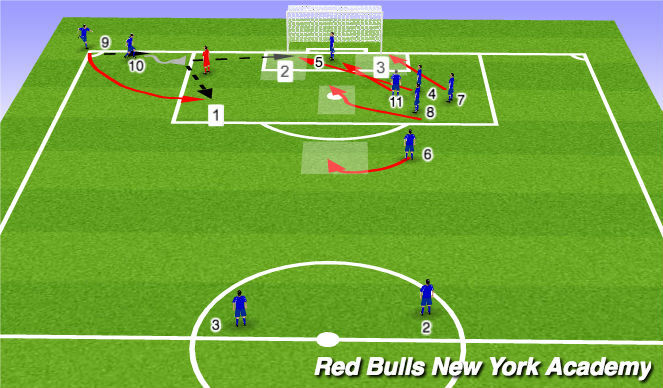 Set up Crossers at each side of goal with three lines of attacking players in the middle. Rotate Right/Left, A dribbles down the lane & crosses as three attacking player finish. Players always look to take the quick, short corner first. If not on, Play a 1, 2 or 3. Play short and drive to near post. Play cutback to cutting runners in box. Drive at defender and lay off for SHOT from overlapping player. Front 2 players are driving to near post for deflection or dummy. Back 3 players are working toward back post for deflection or rebound. Protect Keeper when they go after ball. Players on post step up to get out of Keepers way. Clear ball to shaded areas. Keeper will yell KEEPER when they want the ball, AWAY when they leave it to you to clear high and wide. Step into lanes.